BUFFALO -- Tonight's free concert at Canalside featuring headliner Claypool Lennon Delirium was slated to feature a pair of popular local bands opening for the duo of Les Claypool and Sean Lennon. Apparently it will not. 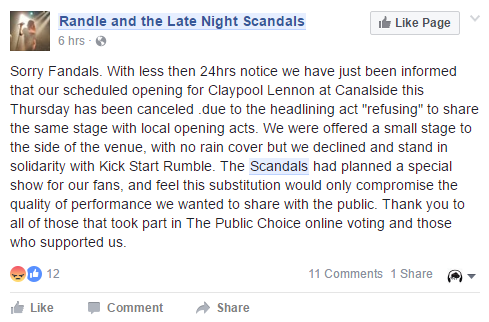 The local bands who had planned to perform -- Randle and the Late Night Scandals, as well as Kickstart Rumble -- both say they have been asked not to at the request of the headlining act. 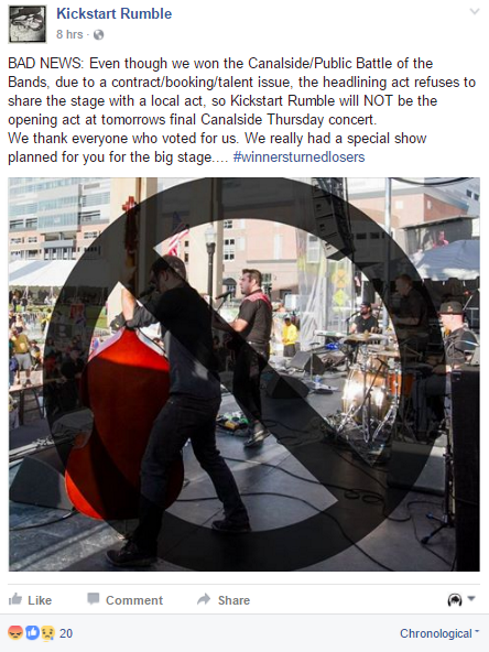 Kickstart Rumble first informed their fans via Facebook with a message shortly before 8 p.m. that said "BAD NEWS: Even though we won the Canalside/Public Battle of the Bands, due to a contract/booking/talent issue, the headlining act refuses to share the stage with a local act, so Kickstart Rumble will NOT be the opening act at tomorrows final Canalside Thursday concert. We thank everyone who voted for us. We really had a special show planned for you for the big stage.... #winnersturnedlosers"
Randle and the Late Night Scandals confirmed the rumor shortly thereafter with their own Facebook announcement: "Sorry Fandals. With less then 24hrs notice we have just been informed that our scheduled opening for Claypool Lennon at Canalside this Thursday has been canceled .due to the headlining act "refusing" to share the same stage with local opening acts. We were offered a small stage to the side of the venue, with no rain cover but we declined and stand in solidarity with Kick Start Rumble. The Scandals had planned a special show for our fans, and feel this substitution would only compromise the quality of performance we wanted to share with the public. Thank you to all of those that took part in The Public Choice online voting and those who supported us." Fans of the two local acts, needless to say, were not pleased. Many took to the Facebook page of the headlining act, asking why they refused to share a stage with local acts, getting no response in return. Others went to the event page, being slightly less diplomatic about it. One post asked, "Will I be able to hit Sean Lennon with rocks from the general admission section, or will I have to pay $55 to be close enough to hit him?" Another said "Shame on The Claypool Lennon Delirium for not supporting local bands!" As for why the decision to pull the local bands from the show? That is yet to be determined. Both acts say it's due to Claypool and Lennon -- sons of Les Claypool and John Lennon -- "refusing to share the stage" with the local acts. However, the Claypool Lennon page on Facebook has no complaints from other shows they've done. Just a lot of complaints from Buffalo's show -- all posted in the last 12 hours. It's hard to believe that there aren't local music fans in Detroit, Mich.; Columbus, Ohio; or Scranton, Pa., all cities the band has performed in recently. In fact a comment from a fan in Detroit notes that "the opening act" went on at 8 p.m. for the show there earlier this month with the headliners taking the stage at 9 p.m. Surely, more will come out about this last-minute decision to pull two local acts from the show. For those who were really hoping to see the local acts, Randle and the Late Night Scandal is playing Lockhouse Distillery on Friday and will be performing during Music is Art on Sept. 10. Kickstart Rumble, unfortunately, doesn't have any upcoming local events listed, however.